"We're going to Crazy Doug's!" exclaimed Bill. They all piled into the SPM-2 and took off. Ron had to sit in the back. Ron did not enjoy sitting in the back. The back of the ship was always damp, and the wallpaper was crusting off, and it smelt moldy. He was pretty sure they were trying to have him get sick, so they could bag him altogether. Fools! He thought. One day they will see my genius and regret how they treated me. Trumpets began to play in the background of his mind. A fanfare to himself. He sulked some more. "Ron," yelled Bill, "stop trumpeting through your lips like a broken kazoo." "What's wrong with my trumpeting?" whined Ron. "It sounds like a dirge," said Bill, "I don't like dirges. I suffer enough without having to hear your chants of misery." Ron sulked in silence. Somehow this irritated Bill more, but he ignored it after a while. Bill peered into the distant expanse of space and acknowledged its vastness. He figured it was probably vast because of some trick with mirrors. Bill had been reading about those tricks you can do with mirrors and was pretty sure the universe was a trick with mirrors. Ed looked at the distant expanse of space and adjusted his nifty rubber chicken hat. The legs were getting in front of his eyes, and he was having a hard time seeing past them. He could have moved them, but he didn't because they were getting in the way of a strange glare that was coming off of an upcoming planet that was singeing his eyes. 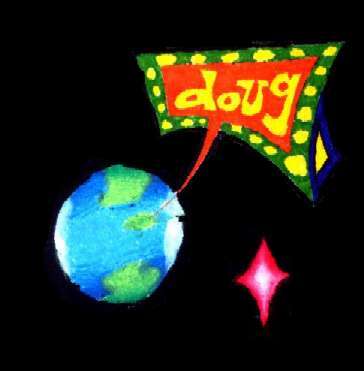 "Crazy Doug's" said Bill with a sigh, "That's what that bright spot on the planet is. Five thousand foot tall shrines to the name of Doug and the greasy food within." "I like frap burgers," said Ed with glee. He turned his head and smiled at Bill. "Yes," said Bill, "We'll probably get to have some there. I think the High Council will even pay for them as research." "Can I have five?" asked Ed. "Maybe even six," said Bill with a wink, "They'll never know the difference." Ed squealed with delight, and then gurgled. Crazy Doug's is on an island in the middle of an ocean on Greasy Nine. Nothing else exists on the planet of any important to anyone except that lives in those parts. I don't care, so you don't have to either. The oceans on Greasy Nine are blue. The islands are yellow. They have a lot of palm trees on them. Tropical successfully describes the place. Orange juice as well. Slowly their ship landed on the planet with a flash. SPM-2 was mighty proud of that ability. SPM-2 slowly opened one of its bay doors, and steps dropped out like one of those Jacob's Ladder things. Plop plop plop plop plop plop plup. Hiss. Chink. "Please exit out of the side door," said SPM-2. Ed fell out, Bill walked out, Ron dragged himself out. "Goodbye," said SPM-2, and zipped himself back up. Tick thud wup wup wup wup ding. Throngs had already gathered out side of Crazy Doug's to greet the Galactic Defenders. A special "Welcome Galactic Defenders" neon sign had been raised. Kazoos and trumpets were all playing the loud exotically berserk kind of music that Ron felt made him into a joke. The fanfares he had been imagining earlier were the kinds that are slow and majestic. Often they were written by obscure composers who were so far ahead of their times that they were rejected in their own day. They were so rejected that they continue to be rejected whenever mentioned, except by the elite few that apparently includes Ron. Ron was a composer of unappreciated egotistically intellectual music as well. He was proud of it. The things coming into his ears now were making him sick. Before them Douglas approached in his fatty glory. He was hoisted up onto a platform that was being held aloft by a dozen women. Several were dropping grapes into his mouth and fanning him wildly. He smiled as he got closer to the Galactic Defenders and signaled that he be lowered to the ground. He got off and approached the Defenders. Considering his size and the way he walked around like he ruled the world (which he did on this particular world) many would figure he would get something other than a kazoo solo. But that's the kind of thing Doug liked. So did the Bill and Ed and most others. Ron disliked it. "Welcome," said Doug, he looked at them all, golden chains gleaming off his neck, "to Grease Nine." He gave each of them a large hug and a frap burger. The frap burgers. The glorious suculent frap burgers. The food of a galaxy enwrapped with happiness. Juicy, moist, made of the greatest material of all frap. Frap is produced by the Galaxy Crystal. They ate them all. Then they had another and another. Doug apparently brought enough for everyone to have their full. Ed still wanted more, so he had to send someone back to get another for him though. Then they trooped towards Crazy Doug's. "Glad to have you back," said Crazy Doug with his large arm around Bill's neck. "Thanks," said Bill, "Glad to be back. It's been a long time since I've lived. Mostly I've been loafing in our secret hideout place. Listening to Ed lose things and find them again, while Ron goes on and on about his stupid brain kinda gets to me, ya know." "You know my theory of life," said Doug understandingly, "Just give 'em another burger. They'll get over it." "Yeah," said Bill, who looked across the beach at the waving palm trees, and sighed a sigh of a Galactic Defender who had wanted to sleep in that morning. Bill was still bitter. He looked back at Ron who was about to eat another frap burger, and swiped it out of his hands and ate it for him. Doug laughed and gave Ron another one, who grabbed it and gave Bill a dirty glare. Behind them, Ed was on the platform hoisted high by the dozen women. They were fanning him and feeding him grapes. He was drinking a frap drink and eating a frap burger. Grapes. Music. The good life. Kazoos. Ed believed his entire life was like this. He didn't need the encouragement. But who could stop someone that looked so happy. "Word from the High Council is that this isn't gonna last much longer," said Bill to Doug. "I know," said Douglas, "I have seen the results of the Galaxy Crystal being gone." "Terribly," said Doug, "You've seen the best we've got out here, but you haven't seen what it's done to my place yet. Terrible things. Doilies. Pastel colors." "Sounds rather unpleasant," said Bill, who looked behind to see if Ron had another burger for him. Ron was lagging behind, and was walking closely to the caravan now. Ron was giving nasty looks to Ed, who was now dancing on top of the platform. Bill laughed at him, and watched for a few more seconds. Ed did a wild somersault flip over and landed in the middle of the platform. Amazing gymnastics, but he broke the platform. It crashed down and all fourteen women Ron and Ed and three camels flopped to the ground. Fortunately only Ron got hurt. Doug gave him another burger before they went into Crazy Doug's. Except for the pastel colors and the doilies, it was empty. And the ruffles on the tables. They were there too. "When the Galaxy Crystal broke down," explained Doug, "we couldn't get any good stuff any more. All they sent us was this junk. It's pretty demoralizing. We don't like being in here too much anymore because of it." A small shiver and a little bit of care went up and down Bill's spine. He wanted another burger, but Doug didn't have any more. They were out.